25% of the films Sam Fuller made were war films. As a rifleman in an infantry squad in the US Army’s 1st Infantry Division (The Big Red One), he participated, on the ground, in every major campaign in the European Theatre. As a trained journalist and novelist, he kept a diary of notes, events, and cartoons, always with the intention of writing a book about his war. War became the central theme and metaphor for all his later work in print and on film (famously, in a cameo in Godard’s Pierrot le fou , he says, “film is like a battleground”). The Big Red One, his last war film, the film he had been trying to make for thirty years, is the culmination of all this (1). The film is divided into eight parts. Nothing fancy about it: all in chronological order, no flashbacks, no interior monologue. The first part is separated from the others. It takes place in the trenches of France and Belgium at the end of the World War I. In black-and-white, with minimal dialogue and maximum hallucinatory impact, it shows a primal scene not part of Fuller’s war experience (at the beginning, the film tells us, “This is fictional life based on real death”) but essential to the narrative circle of the film. A lone infantryman called The Doughboy (Lee Marvin) is lost in the fog and carnage, trying to find his unit. A crazed horse attacks him. He escapes. A German soldier approaches him, claiming the war is over. The Doughboy has heard this before and kills the German, cutting some piping from the German’s uniform. Back at his unit, he is told the war has been over for several hours: The Doughboy’s killing is now unsanctioned: murder, he realises. Fuller is fascinated by this: his mantra for the arbitrary absurdity is “a watch, a pen, a piece of paper”. The Doughboy holds up the piping, which we see bright red in the otherwise black-and-white image, and places it over the dark Divisional shield badge: he invents the symbol/logo/sign, the eponymous Big Red One, which will be fetishised throughout the rest of the film. The film now moves to Fuller’s direct experience (and into colour): 1942, the invasion of North Africa, and the voiceover narration begins, Robert Carradine speaking as Zab, the character in the film who stands for Fuller himself. Zab is one of a group of four new infantry privates (with Vinci, Griff and Johnson) in the squad of The Sergeant (as The Doughboy has now “become” Lee Marvin). The rest of the narrative will be structured by three continuing mechanisms. First, the movement toward recouping and revising the primal scene at the end of the film, moving toward what Fuller calls redemption. Second, the familiar device of a tough old sergeant moulding a group of recruits into experienced foot soldiers. The third, introduced in this second section, involving a skilled, crafty, committed and savage German infantryman, Sergeant Schroeder. He will cross paths with our Sergeant (no name, an archetype, a collectivity) in each of the following sections of the film, as doppelgänger, as Other, as Scar to The Sergeant’s Ethan. Only the second of these aspects is part of Fuller’s experience. The first and third are useful storytelling conventions. And so we enter a web of memory, autobiography, imagination, personal history vs. public history, dream, hallucination, fantasy and the horrific, the unshowable. With these three in place, the film is able to become whatever it wants to, and does so with manic energy. This energy comes from fierce combat scenes, to be sure, as in any war film; but in this film it also comes from an endless supply of contradiction, incongruity, chaos, the surreal, the bizarre, the crude, the vulgar and the outrageous, a fertile mix of which Fuller is the absolute master: it is his art. He puts you much too close to things that make you uncomfortable; he shows you things you’d rather not see and makes you hear things you’d rather not hear. In section eight of the film, the squad helps liberate the Falkenau concentration camp in Czechoslovakia, a very strong sequence; and another sort of primal moment for Fuller, himself from a Jewish family. It was also at Falkenau that Fuller first used a film camera, almost certainly one like the wind-up 16mm Bolex he uses in this film’s cameo. A litany that consumes most of the film in various permutations is “We don’t murder, we kill”, a soldier’s justification. Toward the end, the balance shifts. The male family which has developed through the film, The Paternal Sergeant, and the four privates, begins to be predicated on the survival of this core within the larger group of the squad – as they survive each battle, they begin believe/hope for their invincibility. They begin to exclude other members of the squad (“replacements”, regarded as new, and so not part of the original group) and also expendable, not worth getting to know. The film moves toward a conclusion based on the idea of survival: us, the enemy, civilians, all the same: the only victory in war is surviving. 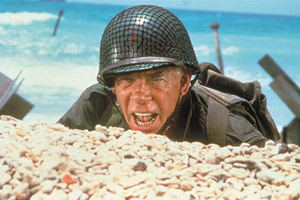 Fuller had wanted Lee Marvin for his Sergeant since the project began to be proposed, and had promised him the part. Like Fuller, Marvin had seen World War II combat (in the Pacific with the Marines, and had suffered considerable battle trauma). Marvin’s controlled, down-played work in the film is remarkable: his athleticism in his mid-50s; his easy familiarity with all things military; his purring, cottony voice, almost never raised, always laconic; his lined and seamed saurian face, and the eyes which miss nothing. Quite a team, these two vets, Marvin and Fuller. Note: two versions of The Big Red One are in circulation, both on Warner Bros. DVD. Lee Marvin, “A Few Words from the Author”, The Big Red One, Bantam Books, New York, 1980. Fuller’s novel is a template for the film and, in its many scenes and events not included in the two extant versions of the film, provides clues about what might have been in Fuller’s 260-minute version. The other key text for further study of the film is Fuller’s autobiography, which positions The Big Red One as the career climax he struggled toward for 35 years. See Samuel Fuller with Christa Lang Fuller and Jerome Henry Rudes, A Third Face: My Tale of Writing, Fighting, and Filmmaking, Alfred A. Knopf, New York, 2002.